Everyone loves a well designed workshop where they learn valuable new skills at the same time as having lots of fun, and it’s good for business, too. Individuals grow their abilities while boosting their motivation. I encourage you to set a good example and start running workshops. Help your colleagues to have fun improving themselves, and you’ll improve yourself, too. Running internal and external workshop for the past 5 years has significantly improved my communication, storytelling, and creativity. Being honest, though, running workshops can be challenging. Along my workshops journey I’ve had many disappointed attendees. Thankfully, I’ve had lots of satisfied ones as well. The key to having satisfied attendees is planning. So in this post, I’m going to share with you my most effective tips for designing fun, engaging, and rewarding workshops. I would advise you to spend a little time up front thinking about the top 5 to 10 takeaways you want to give your audience. As you go through the design process, you will have so many ideas about great content you want to include— hands-on activities, stories, video clips, and so on. If you focus on your learning outcomes, it will help you to pick the most relevant content. When designing learning outcomes, I’ve learned the importance of first starting by thinking about the different types of people attending. I usually run mixed-group workshops for developers, scrum masters, business analysts, product managers, and just about anybody else involved in software development. It’s very easy to focus on one specific group to the detriment of the others, resulting in attendees who didn’t enjoy or get value from the workshop. Make a list of the different types of people attending the workshop: job title, industry, communities they belong to. Here’s the vision statement for my upcoming Strategic Domain-Driven Design workshop at the upcoming KanDDDinsky conference in Berlin. To help individuals improve alignment in their organisation and become strategists. Attendees will learn theories and hands-on activities for collaboratively creating shared vision of the business problem and strategic solution design together. Regardless of job title or skill set, the workshop will provide useful skills attendees can immediately begin to apply at their work, enabling them to engage in business, product, and software strategy. I would advise creating your vision and learning outcomes before you publish the description of your session to ensure you deliver what people think they are signing up for. Why not list your learning outcomes as part of the workshop description like I do? Iterating on an agenda is an effective way to design your workshop. It allows you to zoom in and out, ensuring you create a cohesive experience where each activity aligns with the overall workshop experience and learning outcomes. I like to create two agendas — a high level agenda and a detailed agenda. The high level version reminds me of the key topics and the message I’m trying to convey in each section of the workshop. The detailed agenda is my step-by-step guide to the workshop. The detailed agenda serves two purposes. As a design aid, I use it to justify how each short section of the workshop contributes to the learning outcomes and aligns with the activities before and after. The detailed agenda also serves as a reminder, showing me what I need to do in each section and the key takeaways. 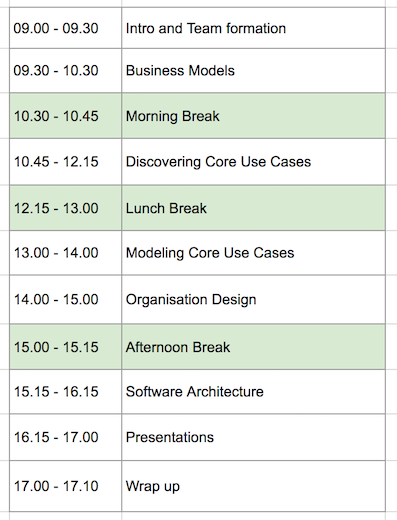 And here is an extract from the detailed agenda for a previous version of the workshop. To create engaging workshops, I’ve learned that it’s essential to get the right mix of hands-on activities, explanation, and reflection with a bias towards more hands-on. Too much of a presenter talking and people get bored. Too much hands on and not enough theory leaves people unsure of what they are supposed to be learning from activities. And without any reflection, there is no opportunity for group learning “Oh, look at what they’ve put on their Business Model Canvas. I didn’t know you could do that! Now it all makes sense”. A detailed agenda is the perfect tool for planning and checking the balance of your workshop. As you can see from the previous example, I have a column showing the type of each activity. I can quickly discern if there is too much talking or not enough hands-on. My biggest piece of workshop advice, and this is purely anecdotal, is to ensure most of the workshop is spent working through hands-on activities. 60% hands-on with 25% theory/stories and 15% reflection is roughly what I’d recommend as a starting point. I spend as much time designing the fun elements of the workshop as I do the theoretical content because an important part of being creative is making big crazy ideas that you wouldn’t normally. People are more likely to do that when they are comfortable and having fun. I can’t tell you how many times someone has tried to make a joke during my workshops and it turned out to be the most genius of ideas. During one workshop, one team were designing a business for flying taxis. It got huge round of applause at the end of the workshop. However, it almost never happened. It started off by someone making a joke, but the room cheered them on to go with it. One of the most awkward parts of a workshop is the start, where everyone has to familiarise themselves and form groups. So I turn this into a game. During my last workshop, I put a sesame street character on each desk and gave each person an Uno card. I then did a gradual reveal. 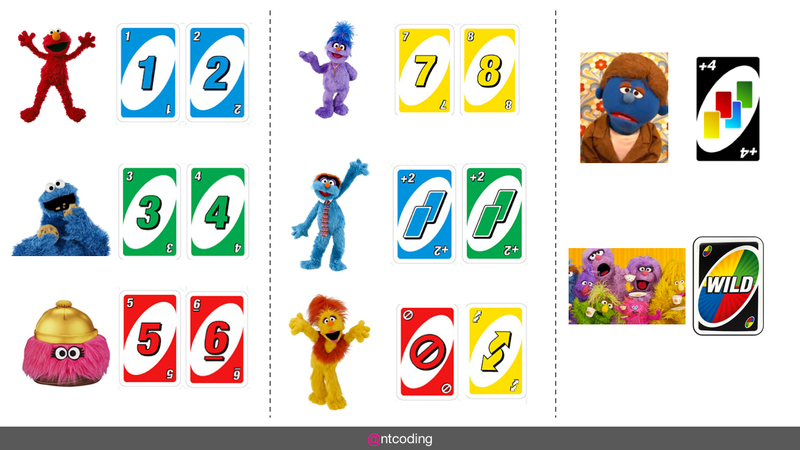 For each Sesame Street character, I showed a group of Uno cards. If you had one of those cards, you had to move to the table with the matching Sesame Street character on. It was immature and light-hearted, but it went down well. One of my favourite parts of creating captivating and fun workshops is the end-of-day presentations. I try to structure workshops so that at the end of the day, each group gets to present their day’s work — a new business they have created, and organisation they have designed, or a software system they have architected. End-of-day presentations are the perfect way to end the day in my experience. 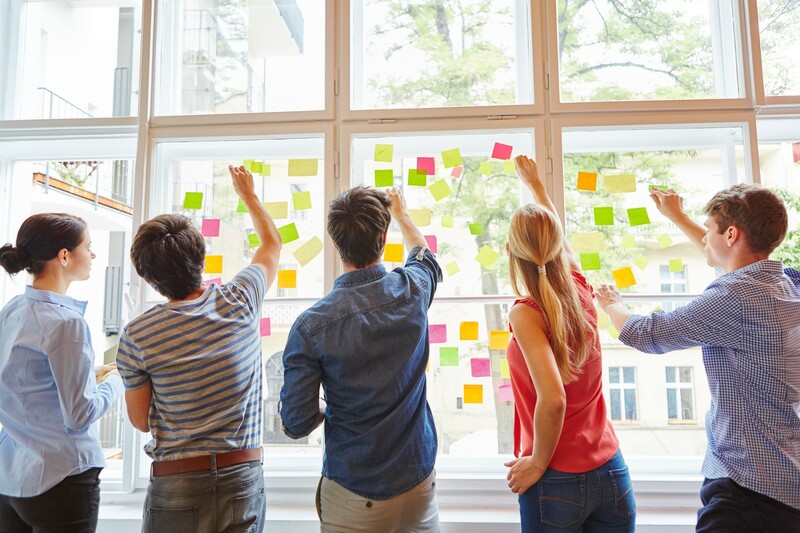 They blend the fun of letting people humorously present their creative ideas, yet reflect on all the things they have learned and how they fit together — and how they can start using those ideas when they are back at work. For the end of day presentation to be most effective in terms of fun and learning, I’ve found that the workshop needs a consistent theme. Each activity should build on the last rather than be completely independent. One of the challenges with this approach is that if teams have too much freedom, struggling with one activity can dramatically affect the rest of their day. So creating that consistent theme is essential if you want the end-of-day presentations to work, but it is annoyingly difficult to design for. My best advice is that you carefully plan each activity. You have to think about your attendees, and you have to think about all of the ways the activities can go wrong and ways to recover from that. It is possible to find the right balance between freedom and consistency, but it requires a lot of careful design and experience of what can go wrong - which is why you should find a workshop partner. I’ve designed and delivered a lot of workshops on my own, but the experience of having a partner is far superior in so many ways. Thankfully, I’m co-designing and delivering my next workshop with the inventive Zsófia Herendi. Working with Zsófia has been a revelation and I’m loving every moment of it. She’s been able to fine-tune some aspects of the workshop and completely transform others. When you are trying to design for fun, trying to create a consistent theme, and trying to cater for different personas at the same time, nothing can give you a greater advantage than having a partner who shares your core values and ideas but has a range of diverse experiences and opinions. Zsófi is a product owner who attended one of my past workshops. After the workshop she emailed me and said something along the lines of “Loved your workshop, but here are a few things which could have been improved”. Her feedback was invaluable… so invaluable that I begged her to do the next workshop together. Since we started working together, not only has she brought greater business/product insights, but she has contributed many great ideas to make the workshop more fun. I’m loving every minute of having a workshop partner like Zsófi to work with, and the workshop will be far superior to anything I could have created alone. Our next workshop Advanced Strategic Domain-Driven Design will be presented at the KanDDDinsky conference this October in Berlin. Come along, we’d love to see you there. If not perhaps another time.